This is an event I thought people should know about tomorrow night and Longman & Eagle. L&E is hosting it's monthly extended cocktail hour with oysters on the halfshell served alongside Belgian beers and sparkling wine this Wednesday, September 1st from 5-7pm. 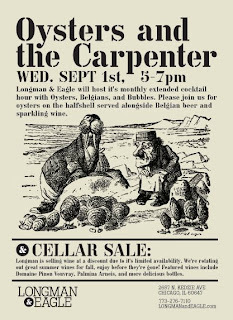 The same evening they're having a Cellar Sale where they will be selling wine at a discount due to it's limited availability and rotating out great summer wines for fall. Featured wines include Domaine Pinon Vouvray, Palmina Arneis, and more delicious bottles. What, another burger spot in Chicago? It seems they multiply overnight but my job is to try and keep track of them all. Using the Yelp scale of grading, I'd give UBB a four or "Yay, I'm a fan!" The burgers were good, the beer list long, the patio refreshing and the service friendly and quick. Do I need to write anymore? Urban Burger Bar reminds me more of a restaurant than bar, especially a burger bar. The menu doesn't scream burgers. There are two main sections, build your own, or choose from eight "stackers." 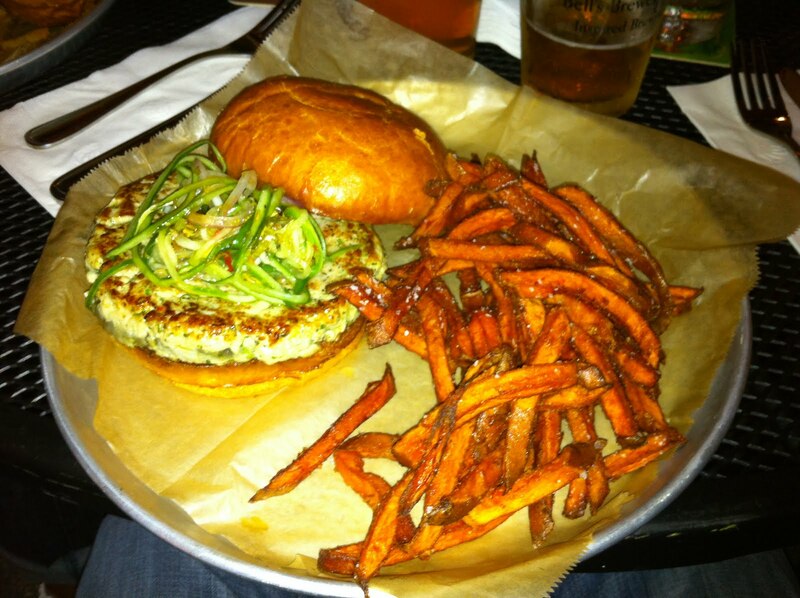 There are also some "un-burgers" such as chicken, veggie, turkey or tuna. In addition, they serve salads and fries. The only two complaints we had was that the prices seemed a bit high, even for gourmet burgers, and that not every burger was cooked to order. The cheapest possible burger is $9 before extras, but we all started with the $12 grass-fed. Each burger comes with fries, which adds value, but not at your own choice (plus truffle fries are $1 extra). I ordered the tuna sashimi burger to test the variety, and was slightly dissapointed. The tuna was more cooked than I anticipated and not all that flavorful. My sweet potato fries were great though. It's been long enough since we had our memorable dining experience at Alinea. Since I've been traveling I didn't want to just throw thoughts on a page. However, I doubt I can add much to the world of Alinea experiences already well documented. After hearing from everyone else, I discovered for myself why everyone calls Alinea "an experience." It’s a magic show with food; a cirque du soleil tableside. You might not enjoy the flavors of every course presented (I had a few...), but the experience trumps all. A stop at Alinea is a must for any serious foodie, food lover or people that simply enjoy being wowed. And surprisingly, the value is remarkable. For the amount of time, the number of courses, the quality of service and above all, the quality of the food, you walk out feeling like you got your money's worth. There are so many reasons why Alinea is the 7th best restaurant in the world and the best in America. The décor is immaculate with equally impressive service. I couldn't figure out exactly how many people were responsible for our table but it never mattered. The table was always perfectly arranged, beverages appropriately filled and the servers knowledgeable and attentive to each course presented. As I mentioned, the food speaks for itself. The wonder and amazement that accompanies each dish is remarkable. While it would be interesting to write about each dish from our 26 course "tour" menu, I will highlight my favorites from the menu. I have already posted the entire dinner in pictures. What better way to top off a great sushi meal than to head down the street and check out the new gelato spot everyone is talking about. I'm not a huge dessert person, but I know some of my friends are. Gelato is more fun than ice cream, if for no other reason than the variety of unique flavors. I also love how you can mix and match all you want and it's all the same to them. It's a cute shop that's usually packed and has a bench outside for customers. 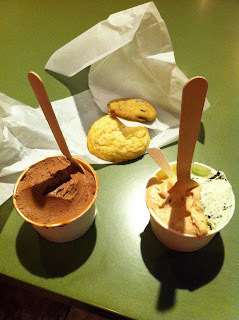 In addition to gelato they serve cookies and other sweets made in the back. When I saw the flavor oreo-mint I became very happy. Those are my two favorite ice cream flavors so it was an easy choice. I had a taste of the malted vanilla and liked that too so I ordered a mostly oreo-mint with a splash of vanilla. Very good. We also couldn't pass up the mini cookies for $0.50 and got a chocolate chip and sugar cookie to taste. Jon outsmarted us all by ordering an oreo-mint cookie sandwich. 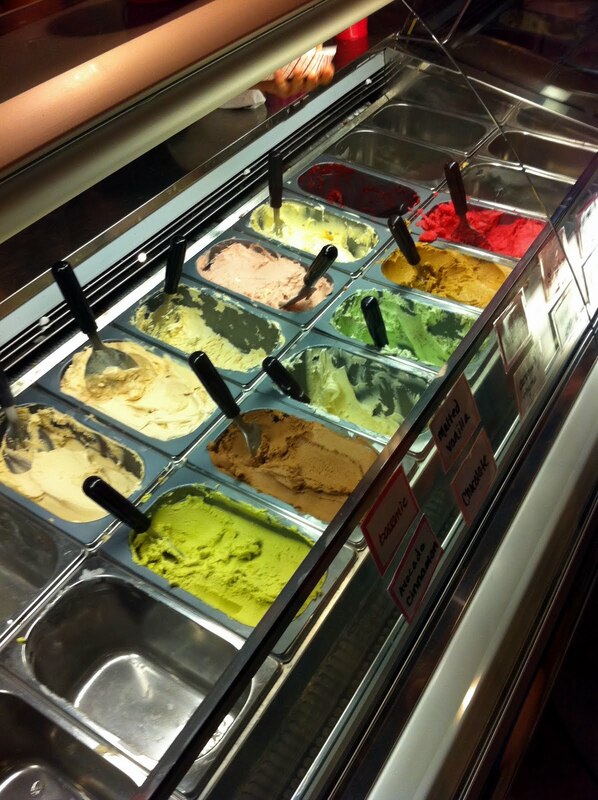 It's a great place to have a refreshing scoop of gelato after a meal or just because. I'm not educated enough to know the difference between world-class and very good but this falls somewhere in between. One of the best reasons I like trying new restaurants is that once in a while you find a really good one before everyone else. Arami is a new sushi spot in Ukrainian village that qualifies as a great new find, especially for my friends that live around the corner. Hot tip too, it's BYOB until they get their liquor license, which is a huge bonus for now. The relatively small space is nicely decorated with a soft wood and homey feel. The menu is refreshingly simple but not "small." 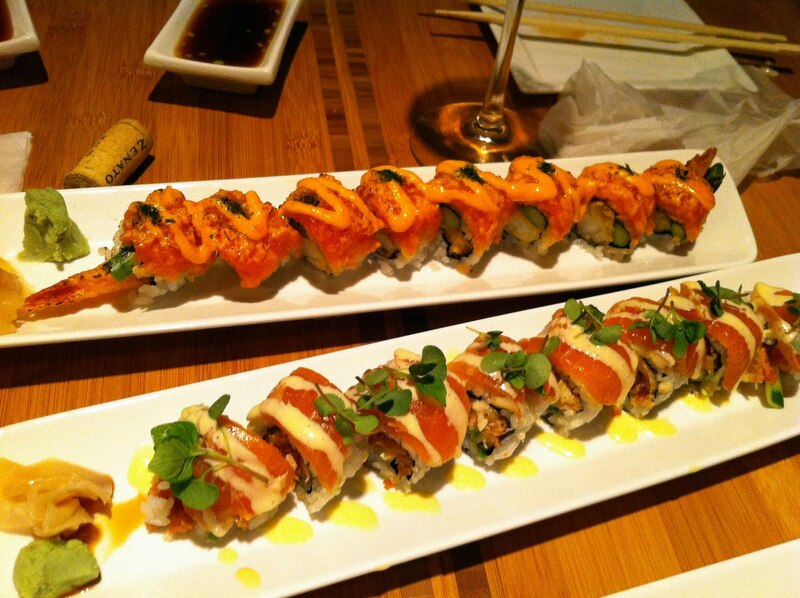 There is ample choices of sashimi and nigiri with a few special maki rolls. 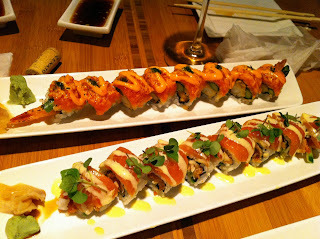 I'm not one that needs a lot of special rolls that cost double the other stuff so I'm happy to keep my options simple. At the top of the menu are a few selections of hot and cold starters, and also a selection of soups, which could soon become a crowd favorite. Our entire meal for 5 included 7 rolls, 1 starter and 1 ramen soup all for $110. Every dish was delicious, attractively presented with good service. Everyone agreed that Arami qualifies for a rare 5 out of 5 rating and is a welcome addition to the Ukrainian village neighborhood (lucky friends I have). 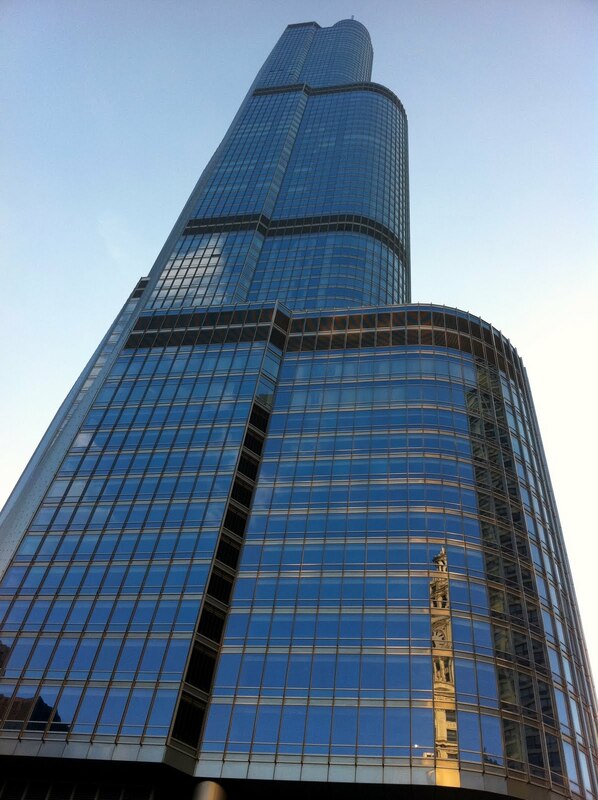 On Thursday I was at the Trump Tower's river walk for an event catered by HUB 51 and wine from Bottlenotes. The night was gorgeous, the tower impressive and the food and beverages were spot on. If you didn't know HUB does events, I highly recommend checking them out. 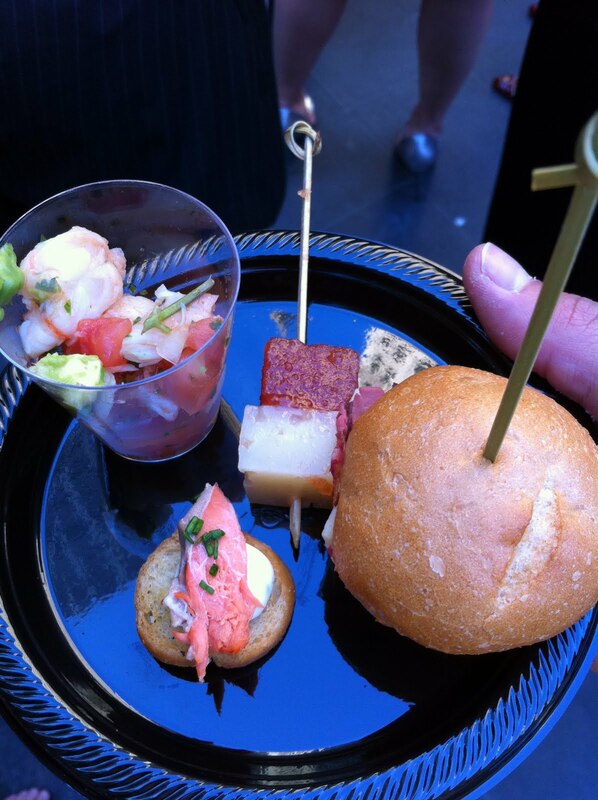 They served mini roast beef sandwiches (I think we ate 10 or so), salmon on cracker, a delicious shrimp ceviche with a nice kick and crab meat on toast. Most people probably went out for dinner after the event, I certainly did not need to with all that good food and drink. Our first place was LM in Plett. It was recommended to us by a local for good Mozambique food (think seafood). The second good meal was in the wine country of Stellenbosch outside of Cape Town. Once again we were directed (always a good move) to a restaurant on a winery called 96 Winery Road. We ate a fabulous 7 course meal with wine pairings (for only ~$50) with a main dish of "Hollandse" Pepper Fillet. It's definitely one of the better meals I've had in a while. 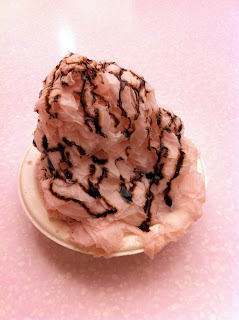 "a delicious frozen treat that can be described as a cross between ice cream and shaved ice. It has a fluffy texture much like cotton candy but melts like creamy ice cream." It's definitely goofy, fully, cold and creamy. It looks cool too. There are 4 flavors, mango, strawberry, vanilla and green tea. 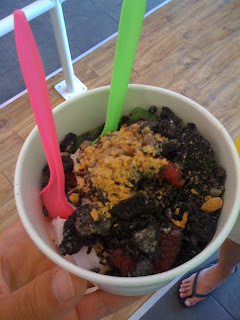 I choose the strawberry wit chocolate drizzle, and erica went chose vanilla with oreo and kiwi toppings ($0.69 each). The funniest thing happened though, half way through we decided to switch and never went back. Strawberry is a "stronger" flavor, that I didn't particularly need, while vanilla is more subtle. The toppings are always fun for me though. One bonus is that they claim a serving of snow ice is only 150 calories (pre toppings) with only 1g of fat. If true, that's pretty harmless stuff (we walked it off by the time we got home...). Erica was a big fan while I'm just 'meh'. If I want a cold and refreshing desert, I'll stick with yogurt and toppings. If you want more fun and creativity, check out Cloud 9 and get strawberry or green tea. In any event it's worth the trip in case you happen to REALLY dig the stuff. I had high expectations because it was a beautiful night, a good menu and a nice beer selection. 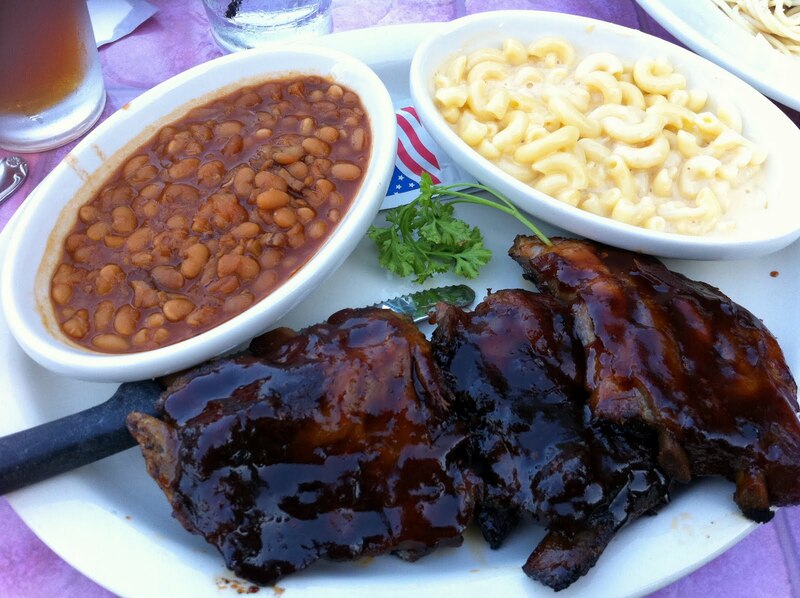 I went with my standard BBQ dish of ribs and enjoyed them very much. The meat was well cooked and melted off the bone. I'm a barbque sauce snob and I approve of the their house specialty. Unfortunately that was the highlight of the meal. My side of baked beans was inedible while the mac and cheese was good but not baked with very runny cheese (some like it that I way I realize). Erica ordered the special of the day, a bottomless bowl of pasta and meatballs, served with garlic bread and salad (all for $9.85). I know you don't normally order pasta at a BBQ joint (and for good reason), but we ordered as a team and didn't need all that meat tonight. The salad was pretty good but the pasta and meatballs were not so good. The garlic bread was a solid rock too. Moral of the story is order BBQ at a BBQ spot for best bet. 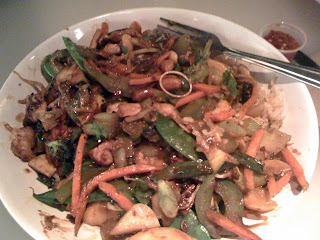 I had dinner at Foodlife Thursday night for my first ever visit to the highly acclaimed food court. Right off the bat I was impressed with the selection and set-up (use of a charge card, pay at the end). Knowing the quality is top notch from the LEYE people, any choice is bound to be tasty. You can pick from Chinese, stir fry, meats from the grill, sushi, salads, desserts, etc. Since you pay at the end, if you leave discipline and discretion at the door, it could make for a long and tasty meal. Out of our group of 5, 3 of us went for the make-it-yourself stir fry station, Erica grabbed a pulled pork sandwich while Tali balanced us out with a salad. Everyone was happy with their selection and there wasn't a dirty plate by the end of the meal. The only complication came with my dish. See if you can notice the "extra" ingredient that doesn't belong. If you guessed "rubber band," you'd be correct. That circle piece of rubber does not belong in my chicken stir fry. I didn't make a stink, but I did tell the manager. He offered me a new dish but I liked what I made so I just kept on eating (I don't regard a rubber band as unsanitary as "human" elements). Anyway, he combed my dish and offered the table desserts. I approve of the professionalism and customer care delivered. Like most concepts LEYE, this one is a hit. It's a simple idea, serve really good food in a "food court" setting and people will pay for it. I don't shop or live near Water Tower Place, but for my out of town guests spending a day on Michigan Ave, I'll send them that way (and avoid helping them make a decision until the last minute). There's been a lot of buzz and talk about Chow Town at Lolla this year organized by none other than Graham Elliot (who cooked a birthday dinner for The President). I didn't get a chance to sample some of the new vendors because I was in a rush yesterday, but that leaves me today and Sunday to change that. Our quick snack yesterday included the always delicious Smoke Daddy pulled chicken sandwich and the vegetarian platter from Lee Concessions. 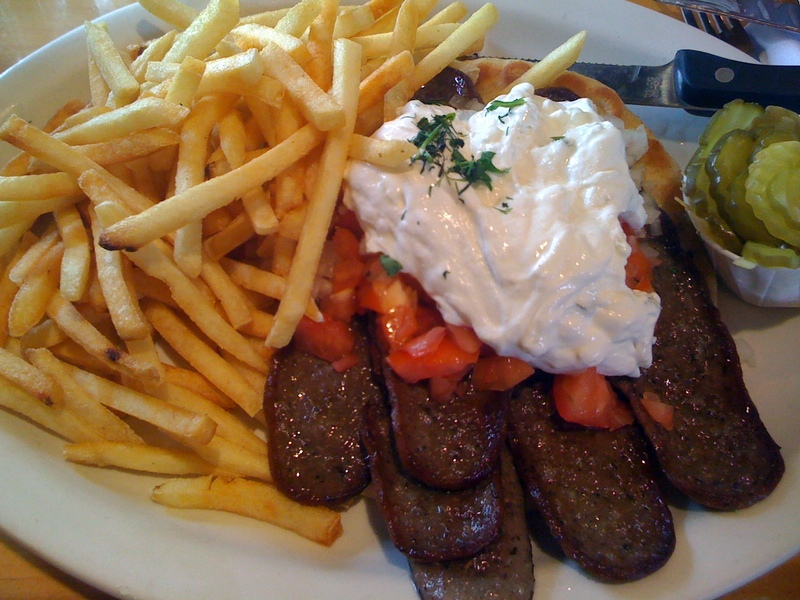 Everything was made to order, fresh and hot off the grill. I look forward to exploring Elate, Blue 13, Big Star and others in Chow Town. What can be better than good festival food and great music at the best music festival in the country? The second pass through Chow Town brought me to the North Side to see what else I could find. 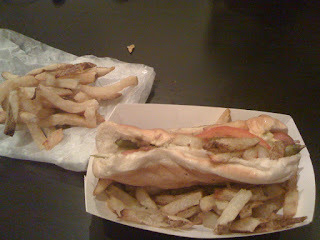 Today was a tasty gyros day from Greek Delights where we had our choice of regular or chicken. We grabbed one of each. Like most reports and my experience, the food tasted good and fresh with plenty of needed napkins. All in all I consumed some BBQ chicken and chips from Smoke Daddy, veggie platter from Lee Concessions, black bean burger from Old Towne Smokehouse and chicken gyros from Greek Delight. Not a bad way to chow down at a festival. Nothing says refreshing on a hot summer saturday like frozen yogurt. I happened to be walking home on clark and stumbled past Berry Moon. I was in the mood and intrigued with a fro-yo place I had not heard of before. It's a do-it-yourself style set up where you grab a cup and fill as much as you can handle. There are various flavors and all priced eqaually (most places charge more for anything but plain). Once you have the yogurt you can pick any number of different toppings and load it up. The pricing is based purely on weight ($0.45 per ounce) and off you go. The experience invoked memories of college dorm excess, but I really appreciate the simple and straightforward approach to the booming world of custom frozen yogurt. Oh, and it's not half bad either. My rather large selection was only 4.85, probably twice as much as I would get at a berry chill or red mango. If you live near by, check it out next time you crave the refreshing and healthy yogurt experience. 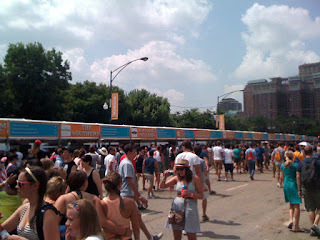 I made it home from the Jamboree just in time to get to Lollapalooza. Once I find some time I can post pictures and reviews that are long overdue. Get excited, Gaga plays tonight It's good to back in Chi.